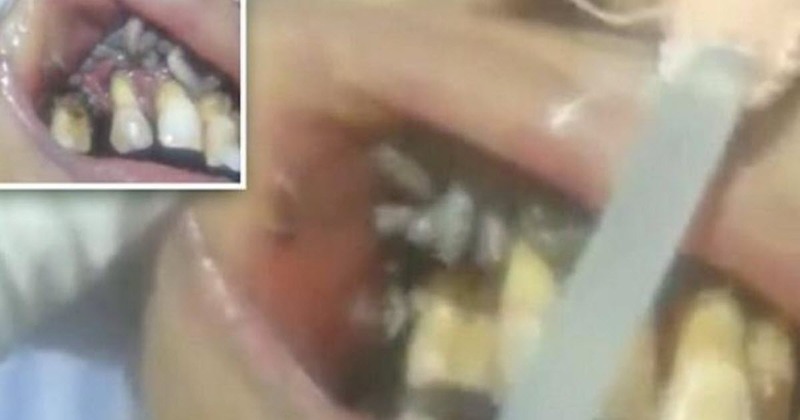 This is the revolting moment an unfortunate dentist came face-to-face with a mouth infested by maggots. In the gruesome clip, the slimy insects, usually found in rotting meat, can be seen wriggling about in the patient’s mouth. The patient, who is believed to be female because of their long hair, has her bottom lip tugged by the dentist to reveal the infestation of maggots. Her yellow, rotting teeth protrude past her eroded gums – an obvious sign of poor oral hygiene, strongly linked to oral myiasis. The clip, suspected to have been shot in India, was posted to LiveLeak. It has so far amassed nearly 3,000 views. The unnamed patient, connected to some form of a tube, can be heard breathing heavily in the 56-second long clip. As her top lip is also pulled away, the true extent of her infestation is revealed as the insects can be seen swarming in her gums. Despite having no official diagnosis, the woman appears to suffer from myiasis – which comes from the Latin word ‘myia’ meaning fly and ‘iasis’ meaning disease. The flies’ larvae can feed on the host’s living or dead tissue, liquid body substance, or ingested food. When the tissues in the oral cavity are invaded by parasites, this is known as oral myiasis. Those at risk of the rare condition include those from poorer social backgrounds and people who have suffered wounds or other injuries to the face. It is also more common in regions with a warmer climate. Infestations of the nose and ears are dangerous because of the possibility of penetration into the brain, the fatality rate is 8 percent in such cases. The clip comes after a horrific footage released in March 2015 showed a young girl whose gums were infested by a dozen of maggots. Ana Cardoso, 10, had been taken to the clinic in Brazil after complaining of a tingling sensation in her gums and things ‘moving around’.